At the end of every year we publish a round up of the park's notable events and achievements in our weekly eblast, MidCity News. A lot happens in a year around here, so the following is an abridged version of our 2010 almanac. You can click here to read the full version, and here to subscribe to MidCity News. Now, let's take a look back at 2010 in Bryant Park. • Fifth season of The Pond at Bryant Park comes to a close. Attendance rebounded in 2009-10 over the previous season, with higher overall attendance as well as a higher per day average. • Bill Cunningham of NY Times lauds The Southwest Porch at Bryant Park in one of his signature photo slideshows. • Final statistics show that, despite being closed a month for repairs in the spring, Le Carrousel at Bryant Park’s ridership in 2009 totaled 75,108, nearly matching the ridership in the record year of 2008. Le Carrousel continues this success with its best January ever. • The Bryant Park Corporation moves main offices from 500 Fifth Avenue to 1065 Avenue of the Americas. • Fashion Week makes a final appearance at Bryant Park. 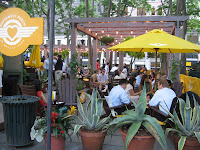 • Southwest Porch at Bryant Park re-launches with new furniture and new menu items. • Southwest Porch at Bryant Park wins two Reggie Awards, bestowed by the Promotion Marketing Association, for the categories Experiential Marketing and best Regional/Local campaign. • Bryant Park introduces free fencing lessons on Fifth Avenue Terrace at 41st Street. • BPC installs Bryant Park’s lawn after completing a project to improve its drainage and irrigation systems. 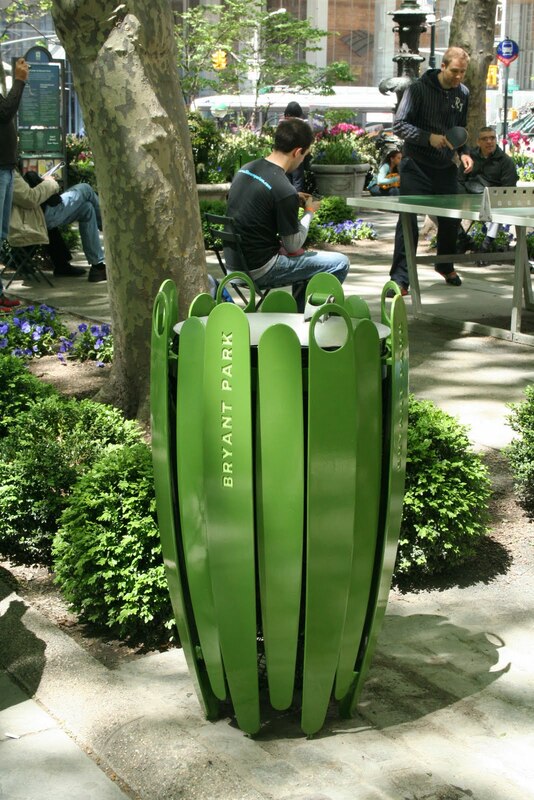 • Bryant Park introduces botanical-themed trash and litter receptacles, designed and developed by Ignacio Ciocchini. The final designs and colors are chosen by Bryant Park Blog readers. • Bryant Park opens lawn to public with ceremony featuring prancing ‘wolves’. • BPC marks one-year anniversary of the park’s blog(! ), Facebook page, and Twitter feed, with each having attracted over 3,700 followers. • BPC introduces ‘Bill McGlaughlin & Friends,’ five free classical and jazz concerts by internationally renowned groups on Monday evenings, hosted by Peabody Award winner Bill McGlaughlin, who is heard weeknights on WQXR 105.9 FM. • Bryant Park unveils a new website. • The 2010 HBO Bryant Park Summer Film Festival, presented by Time Warner Cable, kicks off with a screening of Goldfinger. • BP website adds the Bryant Park Shop, an online store offering items designed to bring the elegance of the park into private homes and gardens. • Dr. Ruth Westheimer appears at a special Word for Word event at Bryant Park’s Reading Room celebrating couples who met, became engaged, or exchanged wedding vows at Bryant Park. • Bryant Park is one of 24 sites for artist Paul Ramirez Jonas’ "Key to the City" project, presented by Creative Time. • Visitors to Bryant Park enjoy STARBOX, an interactive art installation presented and performed by art.party.theater.company. • NPR files radio report about Pétanque at Bryant Park. • Bryant Park hosts a live concert by the iconic British group Squeeze as part of the Artists Den series. Grace Potter and the Nocturnals perform for the series at the park in August. The concerts were recorded for broadcast by PBS in 2011. • BPC completes Phase One of project to upgrade park’s lighting by replacing 20 year-old equipment atop 1095 Sixth Avenue. New energy-efficient metal halide lamps provide superior optics and can be controlled by telephone. • BPC unveils trompe l’oeil technique to ‘camouflage’ the backs of the park’s information signs with photographs. • Thanks to the votes of the park’s fans, BP’s fabulous restrooms take third place in America’s Best Restroom online poll. • Third annual Bryant Park Fall Festival, presented by Bank of America, draws 21,000 spectators for performances by the Metropolitan Opera, Five Boroughs Music Festival, Jazz at Lincoln Center, BAM, Brooklyn Philharmonic, Parsons Dance, and Orchestra of St. Luke’s. • BPC’s free yoga lessons, conducted by instructors from lululemon athletica, and tai chi classes, taught by masters from the Tai Chi Chuan Center, cap record-breaking years. • BPC introduces Fall Birding Tours, in cooperation with the New York City Audubon Society. • With the move of the fashion shows to Lincoln Center, Bryant Park’s lawn is open to the public throughout September for the first time in 17 years. 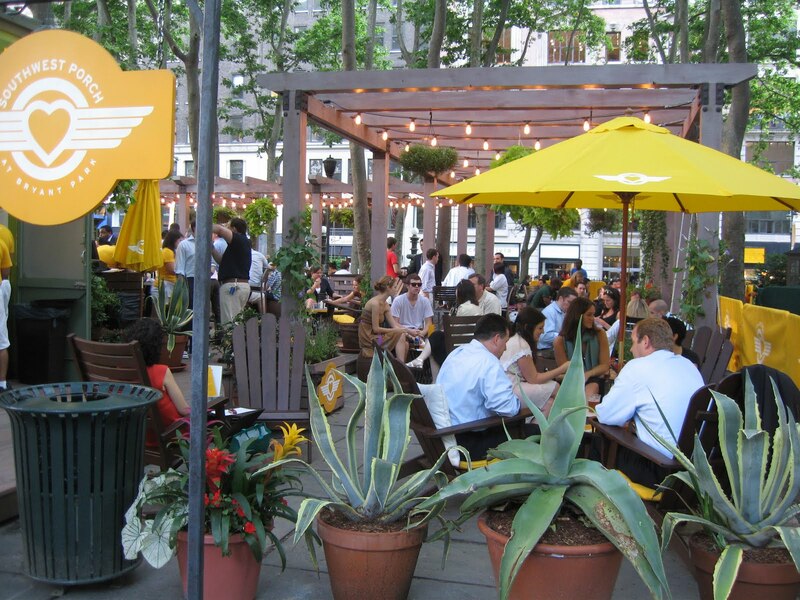 • The International Downtown Association (IDA) honors Southwest Porch at Bryant Park with a Merit Award. • American Planning Association names Bryant Park as one of its Great Places in America in the Public Space category. • Citi PondSM at Bryant Park launches its longest season yet. It will stay open until the end of February for the first time. • Le Carrousel at Bryant Park breaks record for yearly revenue with two full months remaining. • Final BP Fall Birding Tour hits jackpot with sighting of a rare prothonotary warbler. The sighting attracts considerable media attention, including a NY Times story. • Kate Spade installs igloo-inspired pop-up store at edge of Citi Pond in Bryant Park. It is later designated as one of ‘The 8 Coolest Holiday Pop-Up Shops’ by Fastcompany.com. • BPC completes Phase Two of lighting upgrade by installing high-efficiency, double-headed lamps on most of the park’s lampposts. • BPC makes ‘Bryant Park’ t-shirts available for sale at BP Shop. • At the midway point of its sixth season, attendance at Citi Pond is running 25% ahead of last year’s pace.